I did, climbed to the top seats and sat in awe. 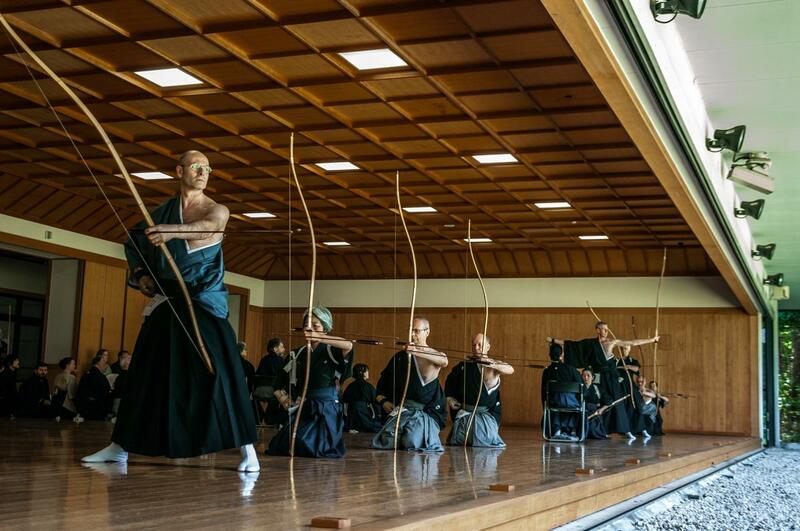 As if floating in the air, the archers were coming in the shooting area in groups of five and execute their elaborate kata involving bowing sitting, arranging their arrows, standing, cocking, drawing, shooting, sitting, repeating with the second arrow and exiting. 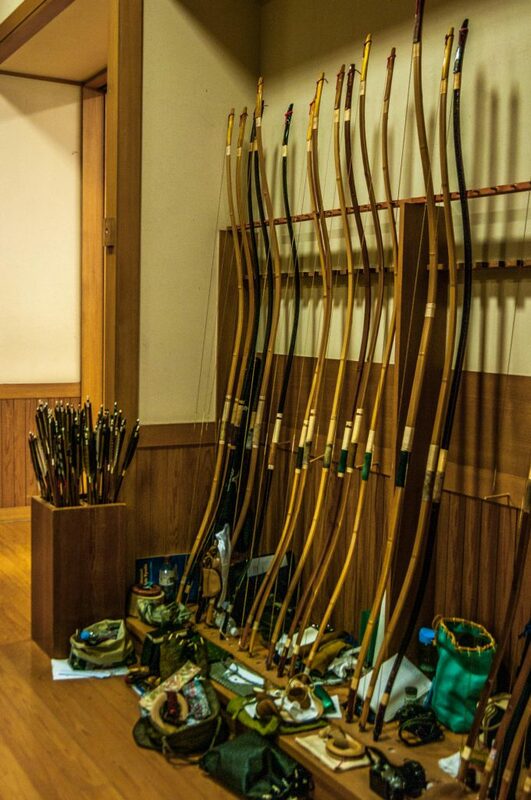 No sounds other than the twang of the string, the thud of the arrow hitting either the target or the area around it and the almost imperceptible swishing of the tabi on the shiny parquet floor –again and again and again. It was mesmerizing and it took me over ten minutes to realize that I hadn’t even taken one picture of them! 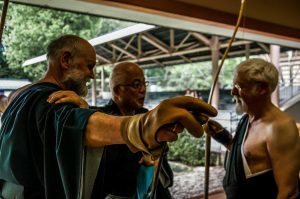 That first trip didn’t last three weeks –it lasted three months and during that time I often returned to the Meiji Jingu kyudo dojo. 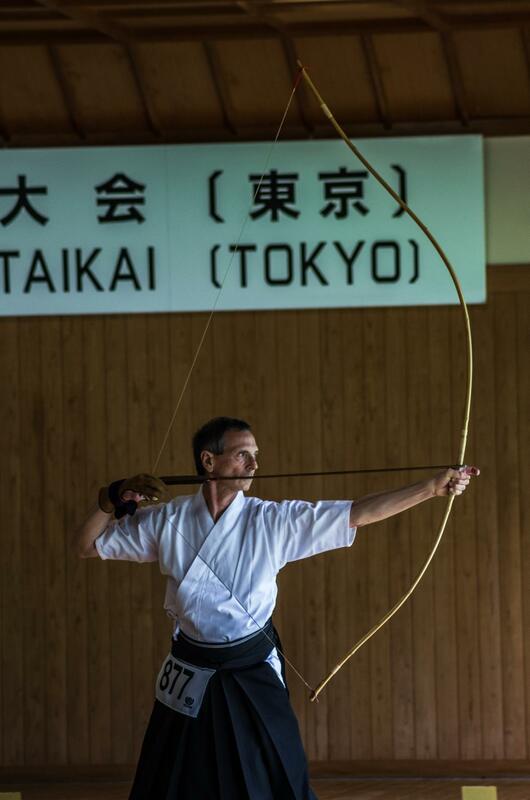 There was always some lesson, seminar or tournament going on and watching them, some things I’d read in Kodansha’s “Kyudo: The Essence and Practice of Japanese Archery” when I translated it in Greece some years back started making sense. 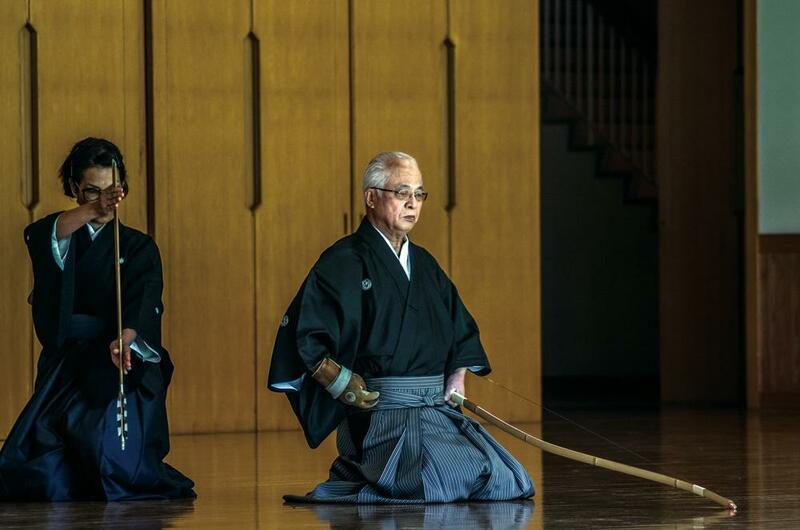 The 8-step Hassetsu kata with the countless details of ashibumi (footing), dozukuri (shaping the upper body), yugamae (preparing the bow), uchiokoshi (raising the bow), hikiwake (beginning of drawing), kai (completing the draw), hanare (release) and zanshin (post-shot alertness), the effort for accuracy but the lack of obsession with it, the equipment –the deer-hide yugake gloves, the asymmetrical yumi bows, the tsuru strings and their rattan tsurumaki holders reminding Kamakura period samurai. 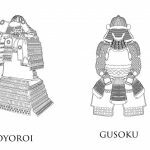 And above all, the continuous striving for perfection through the one time, one opportunity of each shot, much like the ichigo, ichie of sado. 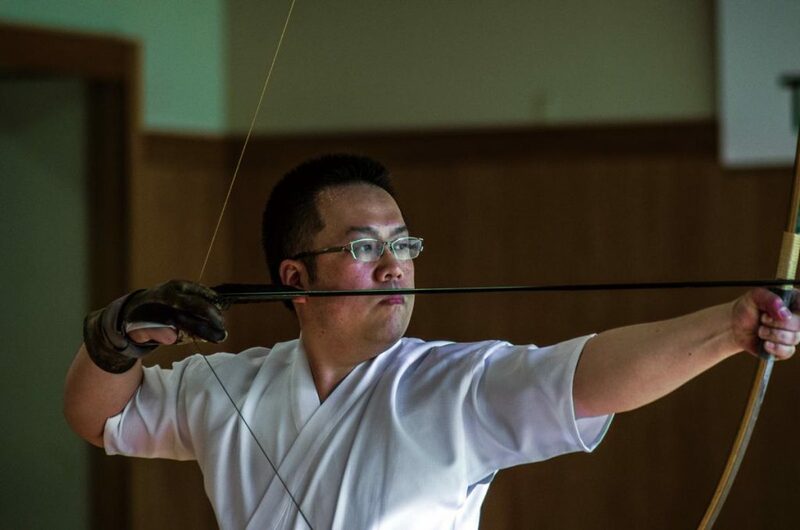 In the following years, I visited other kyudo dojo and watched classic Ogasawara-ryu kyudo in both yabusame mounted archery tournaments and Kobudo Kyokai and Shinkokai demonstrations. 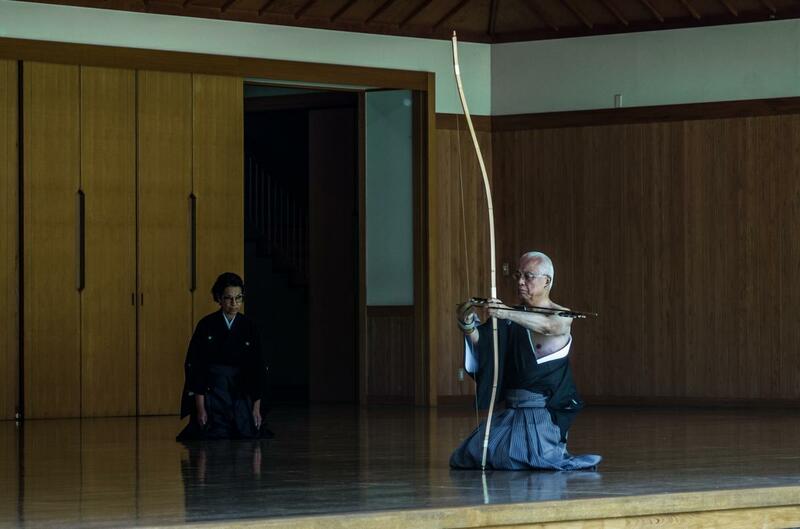 I never got more involved but remained mystified by kyudo’s both meticulous attention to detail and practicality: again, like sado, the kata was important but if it doesn’t reflect in your tea’s quality, (or your shot) then it’s empty, a purely ritualistic choreography devoid of any martial virtue. 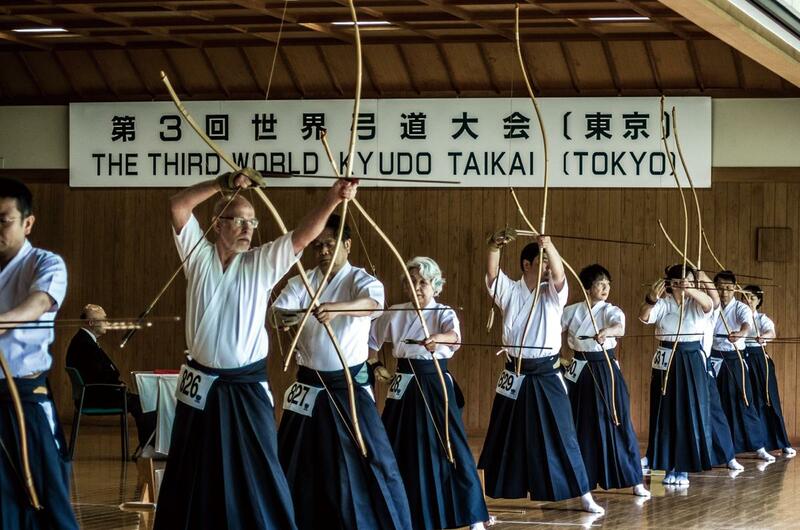 Being fascinated with this consubstantiality, I jumped at the opportunity to attend the 3rd World Kyudo Taikai and the accompanying seminar, visit again “my secret dojo”, see the world’s best kyudoka compete and listen some top teachers teach. 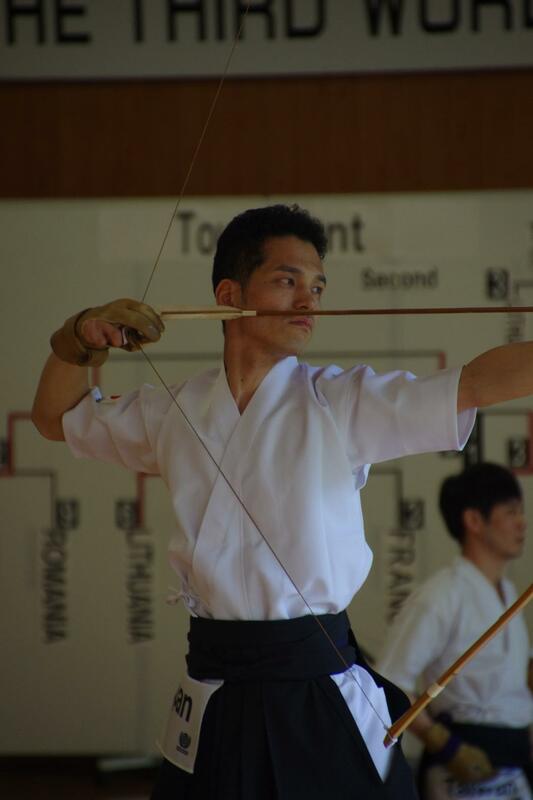 The taikai day was brutal: a heavy rain kept going for the best part of the individual shogo holders preliminaries and finals; this was the tournament’s second day so the highest level archers (renshi, kyoshi and hanshi titles are after 5th dan) were competing but even at that level the size of the crowd was impressive! 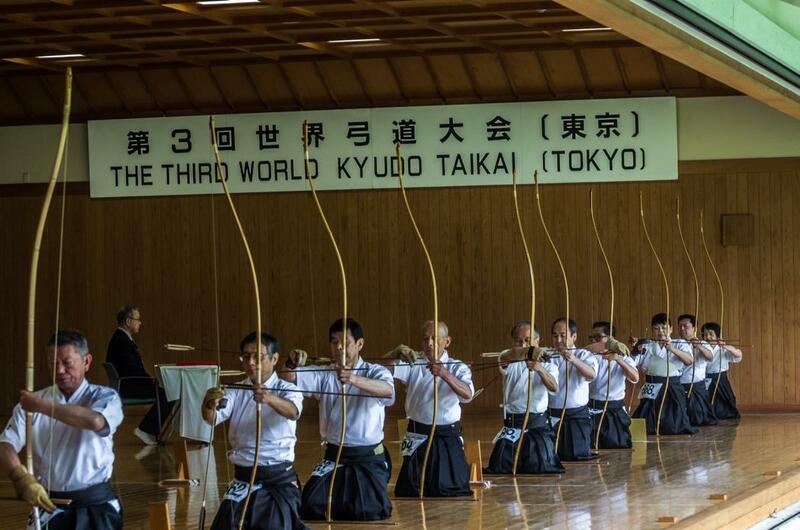 238 archers from Taiwan, France, Switzerland, Italy, Germany, the US and of course Japan lining up again and again, aiming for those 24cm-diameter mato positioned 28 meters away were a testimony to how far kyudo has traveled. Altogether 881 people had come from all over the world –from the countries above but also from Iceland, the Netherlands, Finland, Romania, Belgium, Portugal, Lithuania, Austria, New Zeland, the UK, Sweden, Canada, Russia, Vietnam, Malaysia, South Africa, Mexico, Uruguay, Hong Kong, Poland, Latvia and Argentina to be part of this international celebration of their art and test their skills in the grounds of its homeland. Under this weather the percentage of misses was quite high. 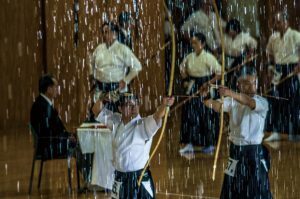 The archers were relatively safe from wind and water but their arrows had to cross those 28-meter wide curtain of water to reach the targets. 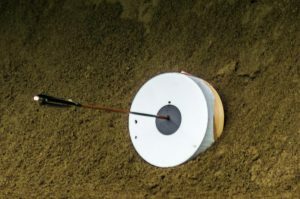 It’s a tribute to the archers’ abilities that enough managed to hit the targets and after noon, when the sun came out, we moved to the competition’s most interesting, i.e. 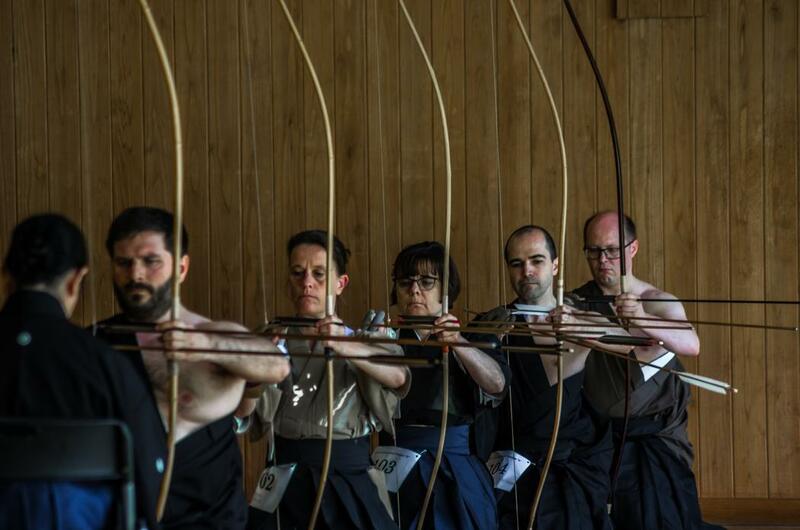 the narrowing down of the participants, the change of the target from the kasumi with the concentric circles to the hoshi with the black center and the continuing shots until only one archer remained. 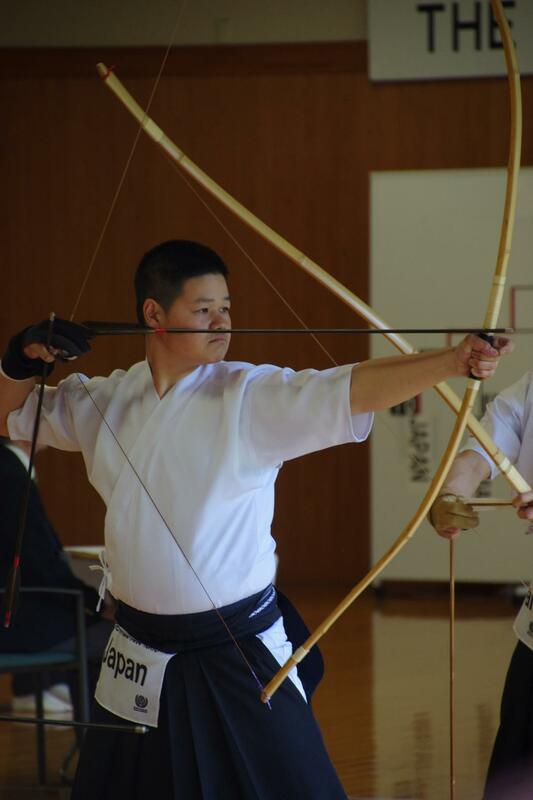 As if arranged for dramatic effect, in the last round, the first five participants missed so when renshi 6th dan Katsuyoshi Takahashi’s, arrow hit the target, the crowd broke in a spontaneous roar of applause! For the record, at second and third place were kyoshi 7th dan Hideo Motohashi and renshi 5th dan Tsubasa Yano, also from Japan; predictably, Japan was also the first place winner in the team competition with Taiwan getting second place and Italy, third and dan holders individual competition (4th dan Masaaki Hasegawa, 2nd dan Kenji Ohiro and 5th dan Yutaka Aoki were 1st 2nd and 3rd place, respectively). This was the first time I watched a tournament in a less casual way and to be honest, I have mixed feelings. 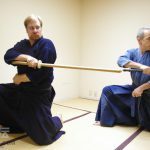 I have never hidden the fact that I’m no sports fan; as a matter of fact, one of the reasons I was drawn to classic martial arts was the complete absence of the element of the sportive aspect (in the sense of competition). 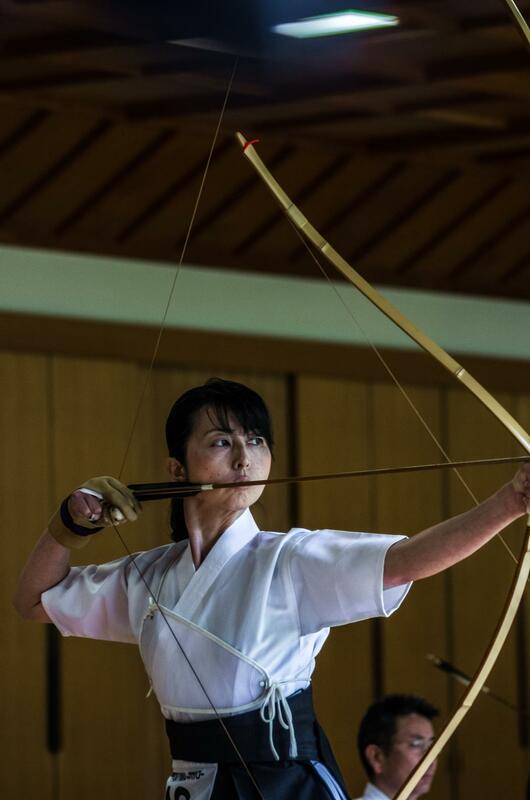 But in kyudo’s case, there is an actual target that you are actually trying to hit and this is something that can be measured objectively –like I was saying in my previous article, about hojutsu and shooting matchlocks, this is the original martial art, the method the first bushi used to fight wars with as authentic today as it was in the battlefields of the Genpei War. 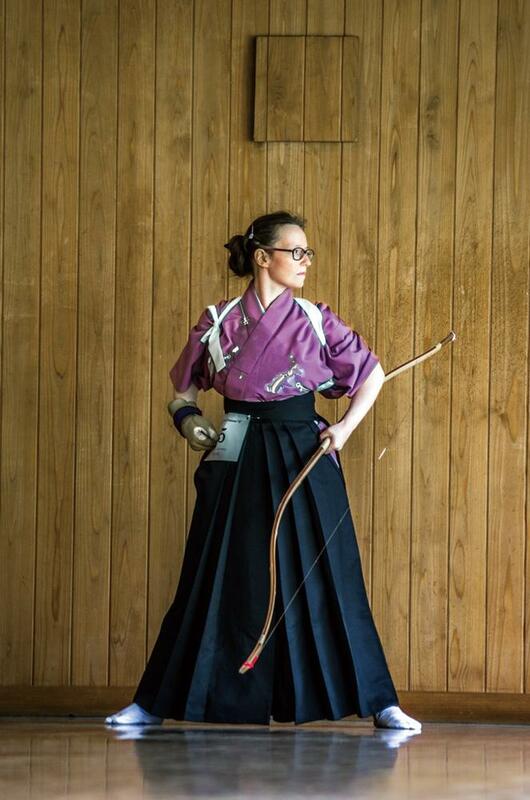 So competition comes natural in kyudo and much to my surprise, it overtook me as well: I didn’t actually support any of the archers but especially during the last stages, I was watching every shot breathless and hoping that they would hit the mato and stay in the game! 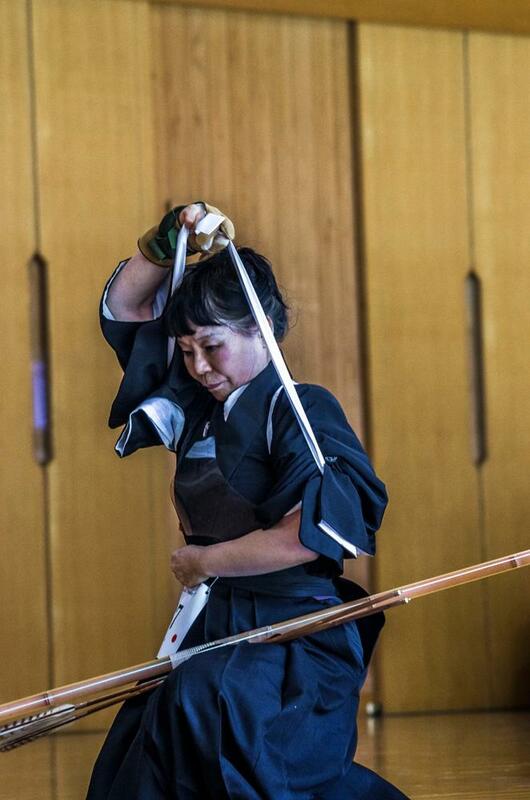 I have never felt the same watching kendo or judo so I guess it all has to do with the directness and the simplicity of kyudo’s aim: you either hit the target or you don’t and it made me think that this is probably the reason the only sport I enjoy watching is sumo. It’s also that basic. 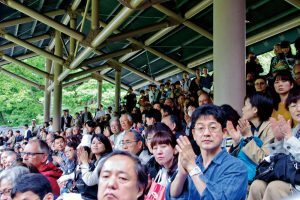 We left the Meiji Jingu and the kyudo dojo only to return the next day; this time I was much more eager because what we were going to witness was much closer to what I’m interested in (not to mention we were going to witness it from much closer!) 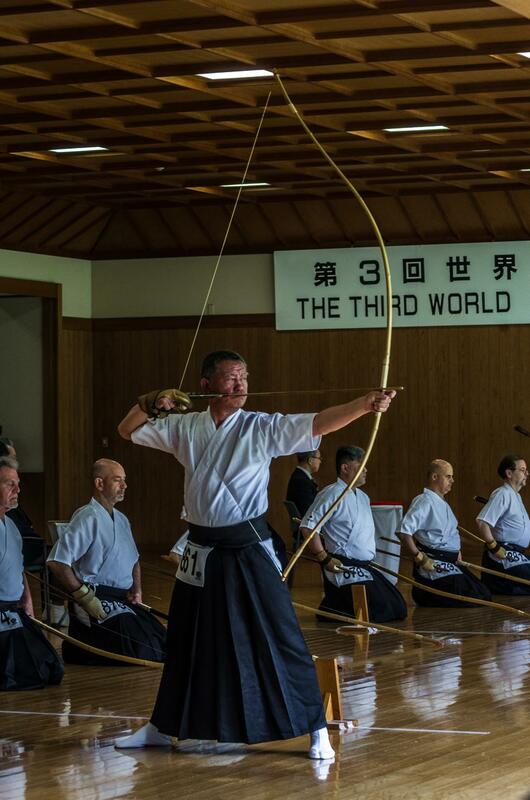 First a yawatashi ceremonial opening shooting by Japan Kyudo Federation’s chief instructor, 8th dan hanshi Hiroshi Okazaki, then a presentation of how a yugake is created by fifth generation craftsman Koichi Soya and then a masterclass taught by four 8th dan hanshi: Okazaki sensei, Terumi Akiyama sensei, Yoshimitsu Usami sensei and Kiyoshi Kubota sensei. 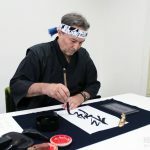 Given that I have equal interest in Japan’s shokunin (master craftsmen) and in its top budo exponents, I entered the dojo, this time from the actual preparation space, the one I had seen from afar that day, nine years ago, practically shivering with anticipation! 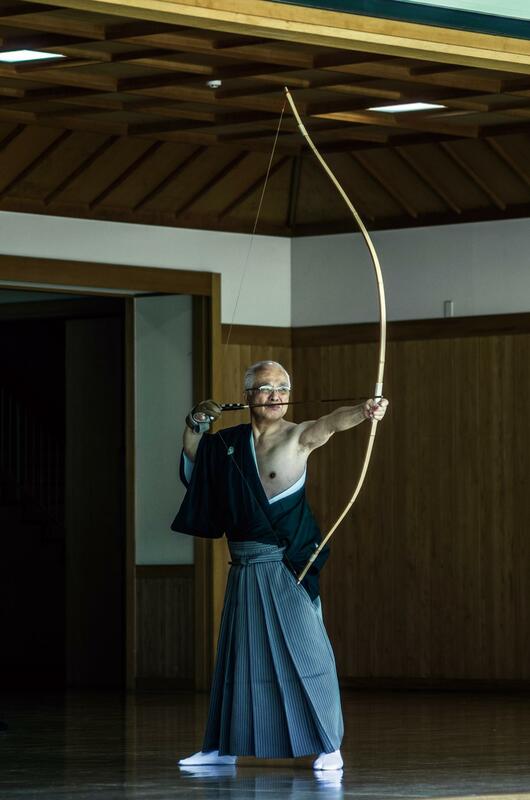 OK, I’m not actually practicing kyudo so 99% of what I was going to hear would go over my head like an errant arrow but when in the presence of greatness something wears off on you -besides, the essence of budo is always the same, right? 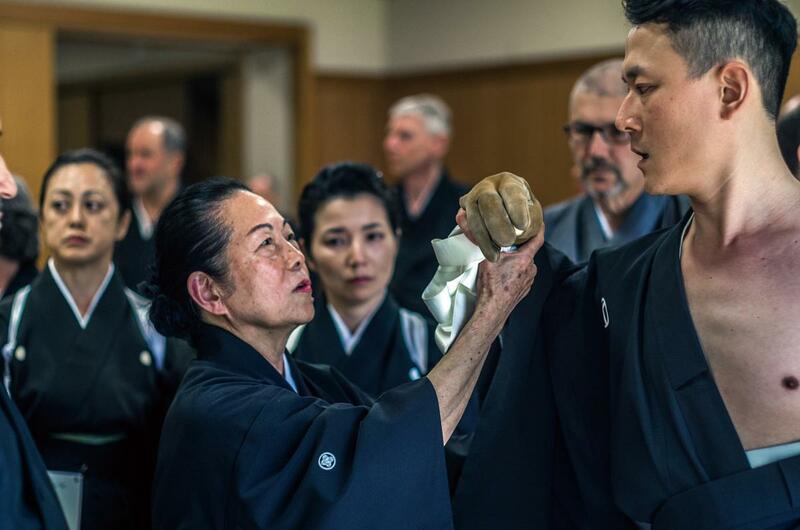 To my untrained eye, Okazaki sensei’s yawatashi was, simply put, perfection: a standard of rhythm, harmony and balance between the ritual and the practical for all kyudoka to follow. With his two kaizoe helpers behind him, the parallel to sumo’s yokozuna dohyo-iri (champion’s entering ceremony) was, at least to me, too obvious to miss and like the yokozuna, the hanshi’s movements and general presence was both a purification of the space through flawlessness and excellence and a kyudo tour de force –the seminar could had ended there and then. 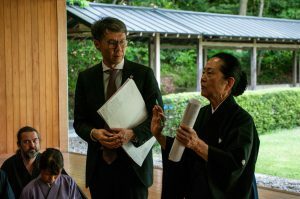 But of course it didn’t: after the yawatashi was over, Akiyama sensei gathered the seminar participants and by criticizing the performance of the two kaizoe (who had been chosen among them) pointed out all the important points of the ceremony and, by extension, of kyudo. This was a superb example of a lecture which I’m certain all participants enjoyed and learned from. 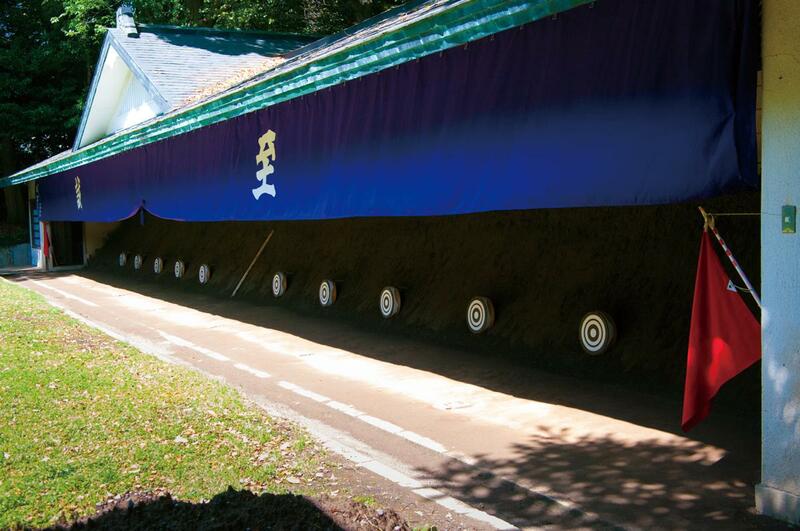 The yawatashi was followed by the equipment demonstration. 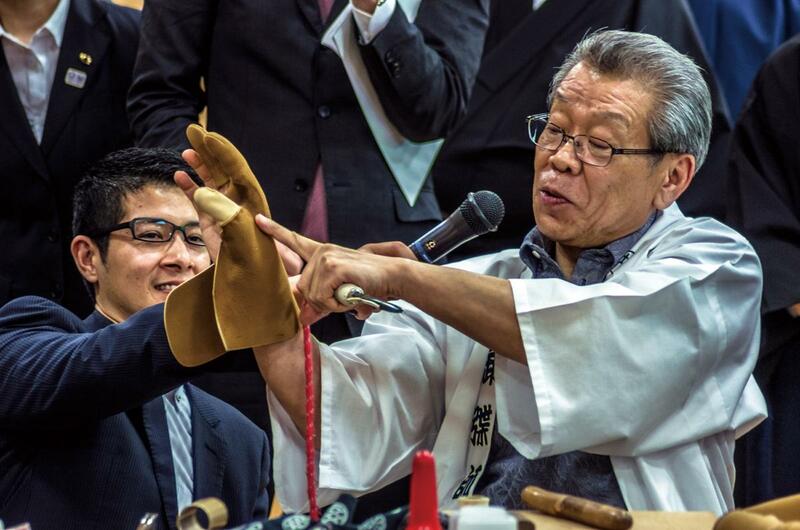 Soya-san from Soya Kyugu in Fukuoka who has been making yugake for decades, set a table, gathered everyone round and went on to demonstrate, albeit in a fast-forwarded version how he creates a three-fingered mitsugake –from cutting the of deer-hide to shaping it, to the final finishing touches. 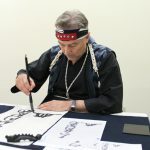 Watching something being born from absolute zero is always amazing and from the comments I heard I realized that not all kyudoka knew how this very important part of their equipment is created; I’m certain that after that presentation, everyone had a better understanding of how their yugake is used and what it takes to make an excellent one. 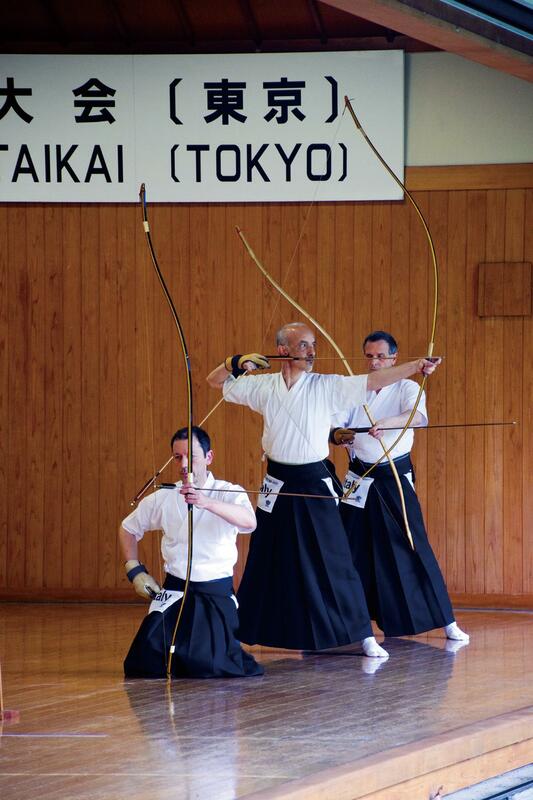 Also, because what we do is shaped by the tools we use, perhaps some developed a better understanding of kyudo itself! And then came the actual lesson: the four hanshi were split in pairs (we got Okazaki and Akiyama sensei and I focused on the former), had all participants shoot once and then explained to them the focal point of the day and had them make smaller, same-language groups and work with each other while they (the hanshi) moved around and corrected them. 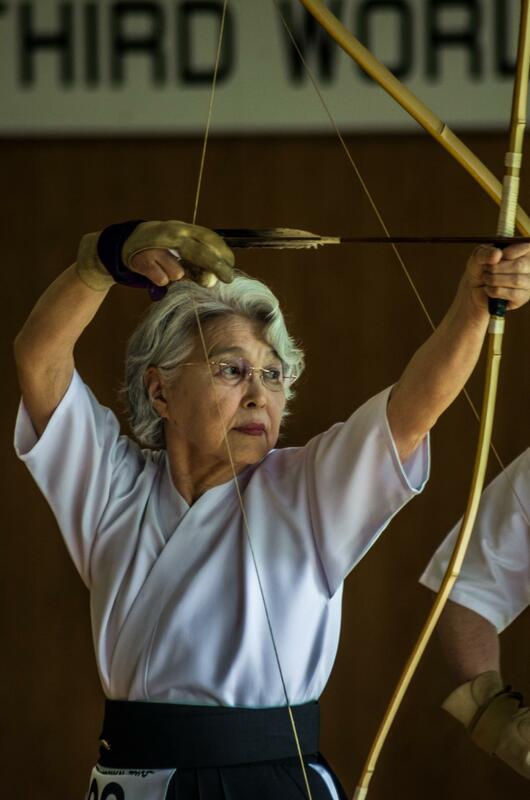 Okazaki sensei was brief: you are all doing OK, he said but you are all missing something, that which will make your kyudo exceptional. 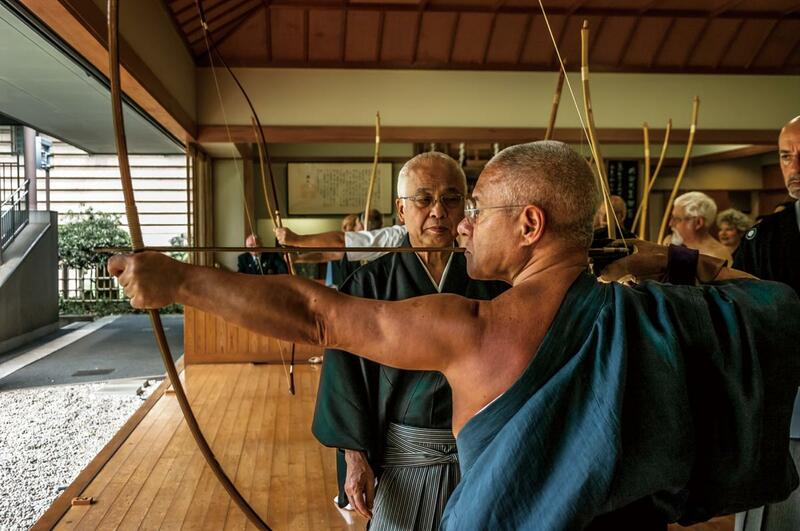 A crucial point is your hanare, the moment when you allow the arrow to leave. 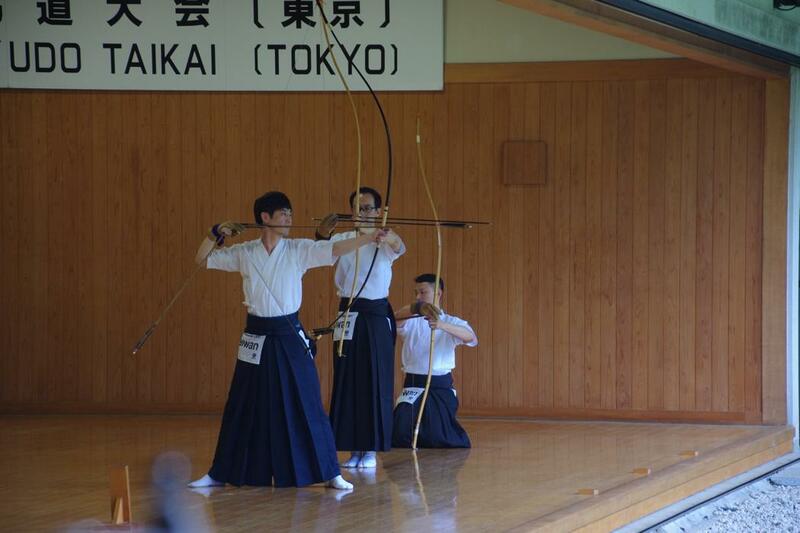 What you are all doing is “hanasu”, release the arrow whereas “hanareru” should be happening i.e. the arrow should be let go and this is what we will be working on today. 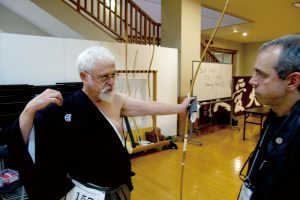 Apparently the linguistic subtlety is one expression of the problem: in the next four hours, Okazaki sensei was going from group to group trying to explain to the archers (remember: these were all 5th, 6th and 7th dans) the best way to organize their body so the hanare would happen without forcing it and how this would transform their kyudo. 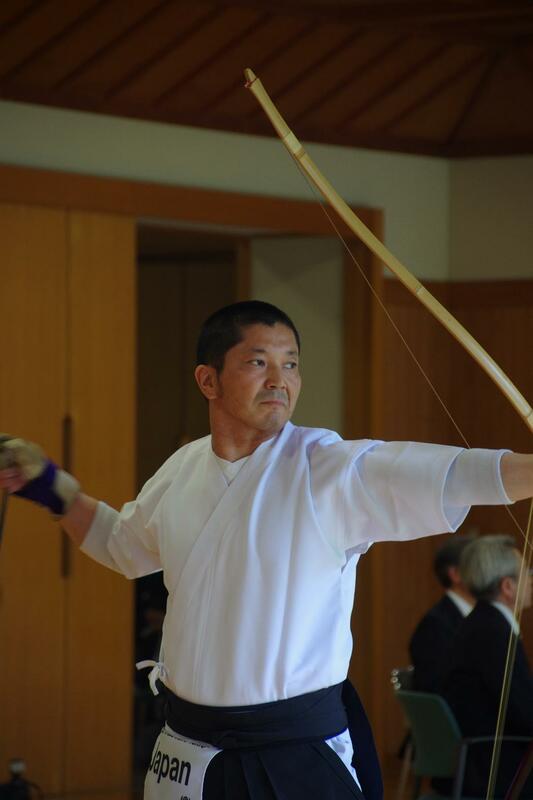 I found his teaching particularly inspiring since it involved an attitude that is very common in old schools but not so much in modern budo: that the archers should aspire to impress everyone watching, to present them with a sight that they haven’t seen before, to become bigger than life and the best there is. 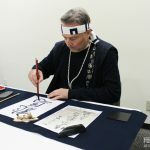 What was interesting was that the core of this attitude was not arrogance but a burning desire to not be satisfied with mediocrity and to try to overcome yourself; in theory this is always a part of budo but perhaps many budoka overdo the humility part and thus, fail to evolve and push their limits. 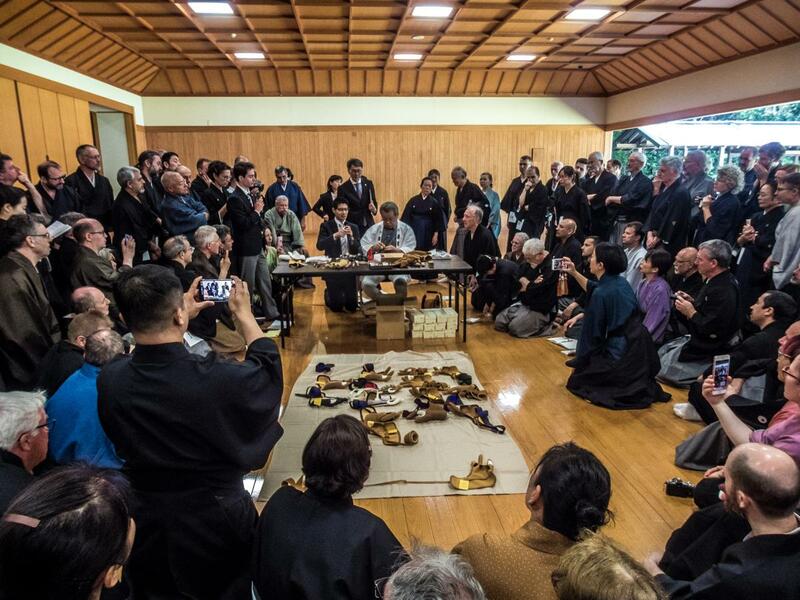 Okazaki sensei’s class on hanare continued until the end of the day; we left with the participants, they for their dinner and we for our homes. 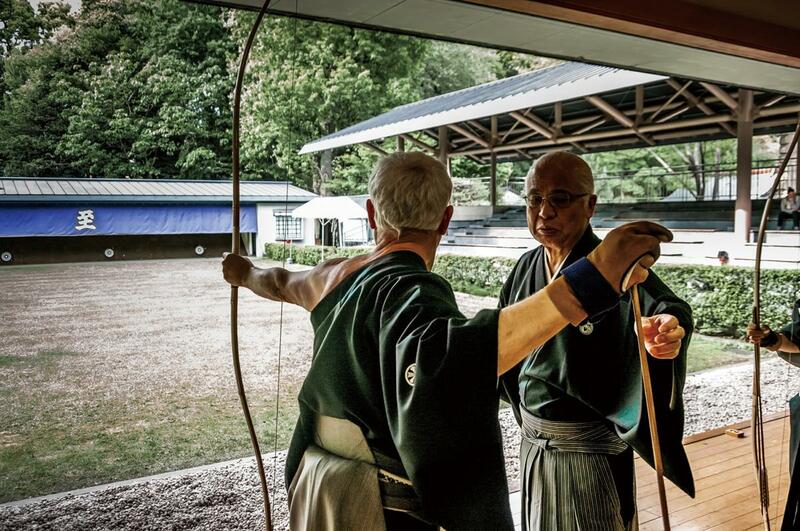 As I walked through the Meiji Jingu paths, that very first time came to my mind and thought that even though I never tried kyudo, it has always been there these nine years I’ve been in Japan. 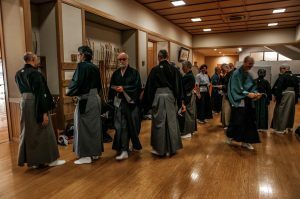 In the Meiji Jingu dojo and in other dojo around Tokyo, in the demonstrations and even in trains and on the street, every time I see kyudoka carrying their equipment, it has been the most conspicuous martial art around me. 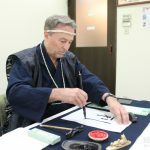 That book I translated, 13 years ago and that first visit to the Meiji Jingu dojo, had confirmed that this is an art that can try even the most disciplined practitioner, demanding accuracy in all levels –literally and metaphorically. 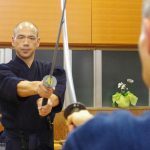 But at the same time, it seems to me extremely rewarding, especially when perfect form meets perfect hit creating the perfect shot that can never be repeated; if there is a better metaphor for living, I can’t think of one! 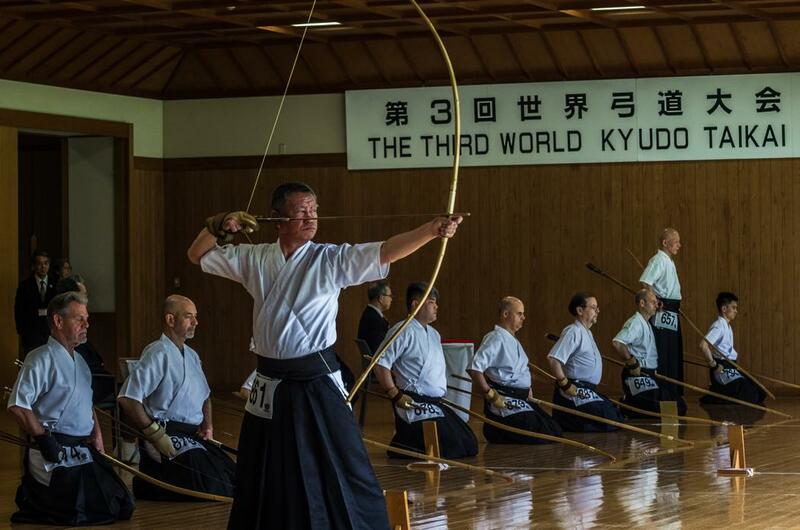 This article wouldn’t have been possible without the help of the Japan Kyudo Federation that allowed us to move around as if we were actual seminar participants. 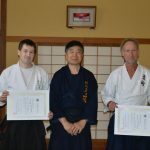 On a more personal note, I would like to thank Earl Hartman, 6th dan renshi from the US for his explanations during and after the seminar. 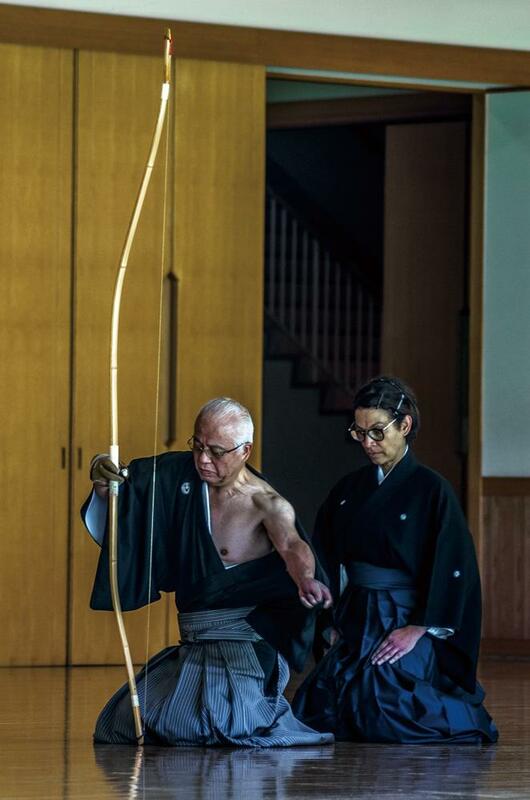 I had met him before socially but this was the first time I saw him in a kyudo environment and his comments and insights were an enormous help in understanding this unique art a little better.